EW Calls The Best of Me Movie the “New” Notebook! Find out why Entertainment Tonight calls The Best of Me Movie "the new Notebook" in this exclusive behind-the-scenes interview with Nicholas, James Marsden and Michelle Monaghan! Watch the video now at EntertainmentTonight.com. The Today Show stopped by the set of The Longest Ride to chat with Nicholas, Scott Eastwood and Britt Robertson. Find out which previous Sparks adaptation made our new leading man cry, and get your first glimpse behind the scenes now at Today.com! Bestselling author and film producer Nicholas Sparks talks about professional bull riding with PBR's Jory Markiss. 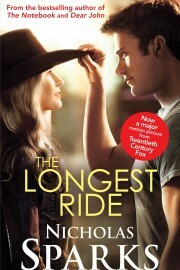 Fans voted Jory as PBR's Sexiest Cowboy making him the cover star for the Walmart exclusive edition of Sparks' latest bestselling novel, The Longest Ride. Watch Nicholas's latest interview at NYTimes.com where he talk about “The Longest Ride,” and how elements like betrayal, loss and honesty are all needed to make a novel work. Cast Your Vote Today for PBR’s Sexiest Cowboy! In case you haven't heard yet, Nicholas's newest bestselling novel, The Longest Ride, features a bull rider and now, you can help decide which of the real life professional bull riders pictured above will be featured on the cover of a special edition of the novel. Cast your vote for the "Sexist Cowboy" and you'll also get the chance to win a trip for 2 to see PBR's Madison Square Garden event LIVE in person this January. Check out the candidates at PBR.com today!